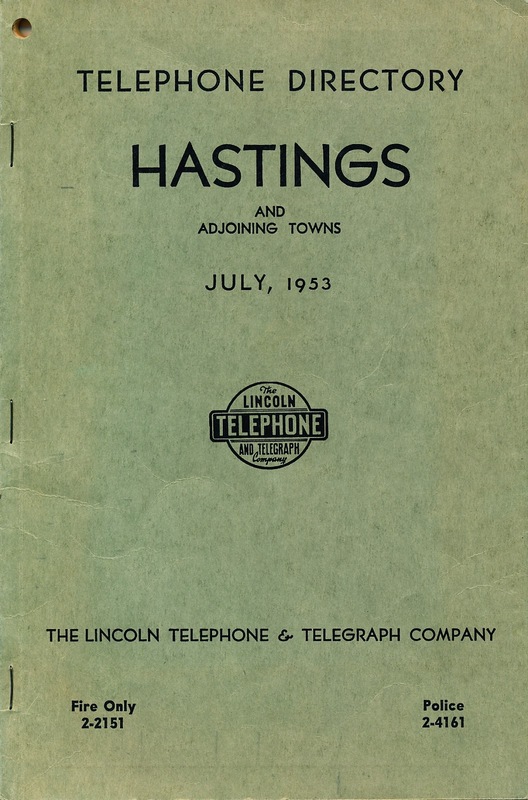 The listing of five-digit phone numbers are for Hastings, Nebraska, about 75 miles west of Lincoln. The population in 1950 was about 20,000. 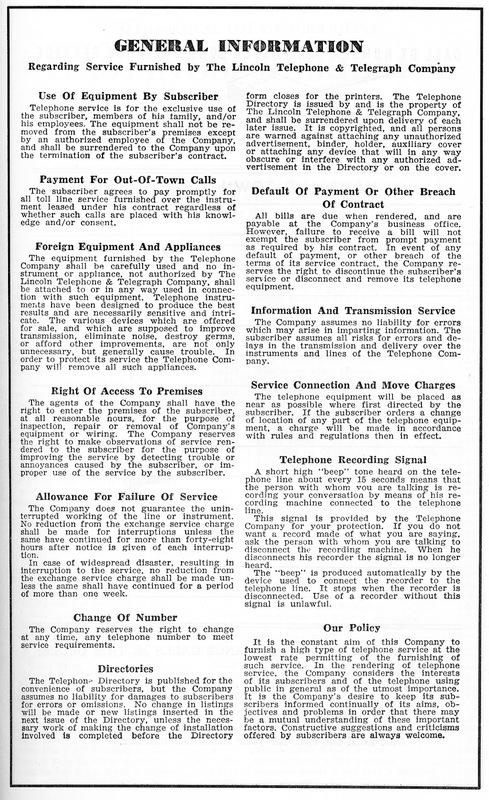 The Lincoln Telephone and Telegraph Company and it's president and chairman, Frank H. Woods, were veritable trailblazers in the telephone field during the first decade of the 20th century. 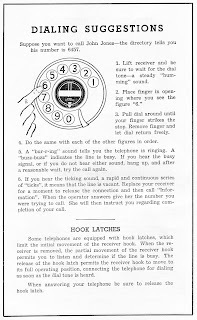 The company was an early pioneer in the use of a dialing system in place of operators connecting calls. The Bell Company didn't think it would work! Go figure. Hastings, well away from the ocean shores, was also home to the largest Naval Ammunition Depot during WWII. There. We've all learned something today. Thumbing through the yellow pages, I found that you had to go to Grace's Bike & Key Shop (authorized Schwinn dealer) for your cycling needs. The only music school listed is Mayo's School of Accordian, dealer for Pancordian and Crucianelli. Ladies got their furs serviced at Geyermans Women's Wear. A couple of rendering plants advertised they would pick up dead livestock for free. Coca-Cola, Dr Pepper, Grapette, Nehi-Royal Crown, and Seven-Up each had bottling plants in town. The FBI had an office in the Post Office building and yes, that was actually listed in the yellow pages. 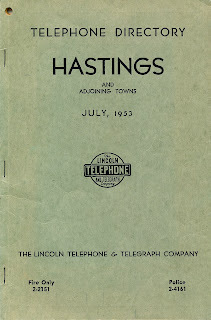 The KHAS radio station still serves Hastings and the surrounding area today and Hasting College is still going strong. Kids, this was how I used a phone back in the day. 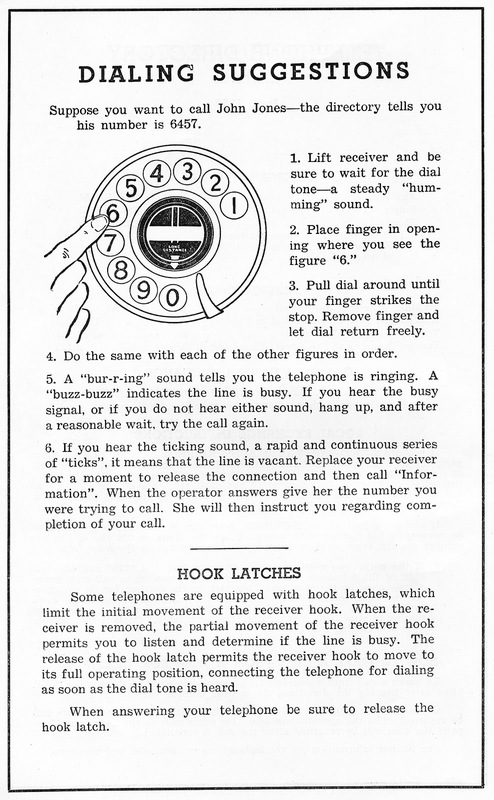 But we didn't have a hook latch with which we could listen in on calls determine if the line was busy. 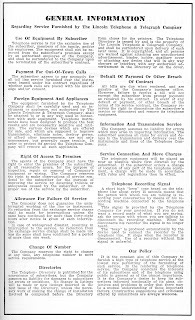 Notice that the phone is for the exclusive use of the subscriber, members of his family, and/or employees. No, you cannot borrow the phone to make a call. The section labeled Telephone Recording Signal is interesting. Would you please disconnect the recording machine? I'm going to contact the museum and see if they'd like this bit of Americana. Wow... wonder how this book got to your office??? And are there more phone books from other remote places? Good work... Keep it up!